The champion of earth sparkles on the big screen with endearing characters and a well-constructed story, proving that he is more than just goofy version of Superman with the same name as a music app. Captain Marvel may have taken his name, but she did not take his thunder. David F. Sandberg’s imagining of the world’s mightiest mortal continues to reinvigorate the DCEU alongside the likes of Aquaman and Wonder Woman. 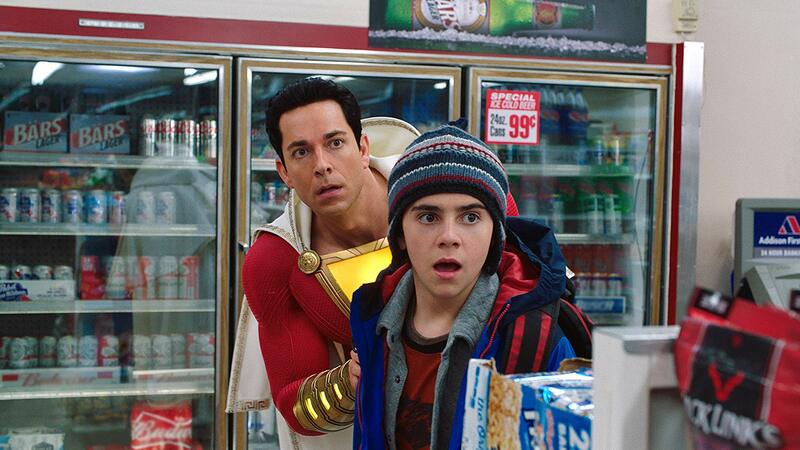 Funny, heartfelt and at times a little macabre, Shazam! pushes the lid of what can be expected of family-friendly superhero film. Zachary Levi is a joy to watch as he brings an exuberant amount of energy as the titular character alongside wonderfully entertaining performances from Mark Strong and Jack Dylan Grazer. All in all, Shazam! is a fun family flick that is sure to entertain all audiences. Asher Angel plays Billy Batson, a child who has ran from various foster homes in search of his mother. He finds himself welcomed into a new family of foster children ran by Victor and Rosa Vasquez (Jovan Armand and Marta Milans). The members that stand out the most are Freddy (Jack Dylan Grazer), a superhero fanatic and Darla (Faithe Herman), the mischievous little sister. While defending Freddy from bullies, he runs into the wizard Shazam (Djimon Hounsou) who bestows his powers to him as a last resort to combat Dr. Thaddeus Sivana (Mark Strong) who wants to absorb Shazam’s powers to become the ultimate being. By saying the wizard’s name, Billy transforms into the muscular superhero Shazam (Zachary Levi) with powers granted by the Greek Gods. Equipped with his new abilities, the film primarily focuses on Billy learning how to be a responsible superhero from the help of Freddy and his foster family. Shazam! is easily one of the more joyful entries in the DCEU, poking fun out of many superhero film tropes and sporting meta humour akin to Deadpool. Many of the film’s best comedic moments happen during the superpower testing montages which feature a lot of physical comedy from Levi. Another strength of the film is its seamless combination of humour with product placements to other titles within the Warner Bros. catalogue. Additionally, snippets of Sandberg’s roots as a horror director also sneak into the film which easily makes Dr. Sivana one of the more terrifying superhero film villains to date. One of the more dissonant aspects of the film however is the role Angel and Levi share. Although Levi convincingly portrays an energetic and excited young teen in an adult body, it is a stark contrast to Angel’s hardened version of Billy. At times, this is distracting since it does not appear like they are portraying the same character. This is especially noticeable in the film’s earlier moments. In spite of this, all of the actors are good in their roles. Levi and Grazer have a great brotherly chemistry as the main duo of the film. Mark Strong is terrific as the menacing Dr. Sivana, depicting his powerset with a lot of grace which contrasts well with Levi’s flashy and somewhat brash approach. The thematic connection between the hero and villain was cleverly cultivated throughout the film, marking a very promising sign for the direction of DC superhero films with Walter Hamada in charge of the DCEU. To conclude, Shazam! is a delightful entry in the superhero film sphere and a strong step forward for the DCEU. Refreshing and enlightening, Sandberg presents an amusing superhero movie with engaging characters, a simple yet well executed plot with a good dash of shocking scenes to keep audiences guessing. Shazam!, directed by David F. Sandberg, is distributed in the UK by Warner Bros. Entertainment, certificate 12A.